The official website for the previously announced Tensei shitara Slime Datta Ken TV anime announced additional cast members on Saturday. The anime will broadcast on Tuesdays at 12:00 a.m. via Tokyo MX and BS11, followed by tvk and MBS beginning October 2. For convenience, information announced in July are also included. A web radio show hosted by Miho Okasaki (Rirumu) and Kanehira Yamamoto (Rigurd) will start on HiBiKi radio station on September 27. The first two episodes will be pre-screened in two separate events in Tokyo on September 17, and in Osaka on September 29. Miho Okasaki (Rirumu) and Yumiri Hanamori (Shizu) will attend both days, while Makoto Furukawa (Benimaru), Mao Ichimichi (M.A.O) (Shion), Takuya Eguchi (Souei), and TRUE (ending theme performer) will attend the Tokyo screening for a talk show. I correctly understood, MC in a new life are agender, but takes a female form to communicate with other people? Or his human form is also sexless? 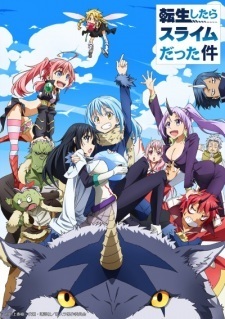 He was a man, he got reincarnated as a slime, and the human form he often takes is female. Go figure what his gender actually is. Well, fan wiki argues that his "human" form is genderless and doesn't have any sexual characteristics. But the fact that MC has a definitely feminine appearance and got female seiyuu in adaptation, leads me to the idea that the title is going to follow the path of pseudo-otokonoko\yuri. Even though I read the manga, your guess is as good as mine. Male AND female characters have been attracted to his human form, and yes, he looks feminine, but his gender has never come up in the manga. Well, I don't know how this is used in plot, but I think that as in the case of Houseki no Kuni, it can give an anime good LGBT fanbase. The premise for the anime sure sounds interesting and thats quite the voice cast they have assembled for it. Well, it's popular, either novel and manga. Hope they won't ruin it, but as long it's an Isekai adaptation, I'm not sure. It's a slime. You do know what a slime is, right? "The only way I could possibly die is by being bored to death. So please, try to not kill me too much, okay?" This series is quite big in Japan from what I know. Not only do first week sales of its LN volumes (~30k) far exceed the usual sales of other isekai series (5k-15k, not counting other top titles like Overlord/Re:Zero, etc. ), but even it's manga adaptation gets into top rankings. Hmm not sure what to make of this. The girls look hot though, will keep that in mind.